Wi-Fi Speed is something that we don’t always think about until Netflix…Won’t. Stop. Buffering. Or you are trying to upload your sister’s baby pictures to the cloud. Maybe you think about it when you web browser won’t refresh your page. Whenever you think about your Wi-Fi speed, you should feel comforted knowing there is a quick fix to your small issue so you can get back to your fast and reliable speed. The first step to speeding up your home wireless network is to troubleshoot. Limit the amount of applications using an Internet connection on your device. Confirm all connections, including power and Ethernet, are tightly connected. Check for lights in the modem/router to verify. Your test will show you download and upload speed results. Now that you have ruled out a network issue, you can focus on maximizing your Wi-Fi performance. There are a wide variety of things that could be degrading your Wi-Fi speed, including the location of your wireless modem/router, the size and structure of your home, and the settings of your router. Believe it or not, some materials in your home can interfere with your Wi-Fi, including wood, synthetic material, glass, water, brick and marble, plaster, concrete and metal. Devices can also interfere with your connection: age of device, microwave oven, cordless phone, and baby monitors. Once the interference is dealt with, you can move on to the steps to speed up your home wireless connection. Centralize and raise the router - If your router is positioned in far corners of your home, chances are you will get spotty signal on the other end of the house. The ideal location of your router is close to the center of your home, in an open area, and at a higher point in your house so the signal can spread slightly downward. Get a mesh network - The eero home Wi-Fi system is a great product that creates a mesh network throughout your house ensuring coverage to every square foot in your home. Set up Wireless Security - If you don’t already have your network secure, it is a good idea to set up wireless security as soon as possible. Leaving your network open and unsecured can lead to potential threats to users of that network, cause series slowdowns, and outside people can hog your bandwidth. To secure your Wi-Fi, log into your router’s admin page and set a password up that is easy to remember. Make sure to only share it with people you trust to be on your network. Update your Wireless Router - Sometimes all your Wi-Fi speed needs is a quick update. Make sure your wireless router has the latest updates to its firmware. Some routers have a built-in update process, but you also might need to access your router’s settings to manually start an update. Optimize settings - Some routers have QoS settings that allow you to control which apps have prioritized access to Internet bandwidth. Let’s just say you always need to video call for meetings, you can deprioritize file downloads from the cloud so your calls can remain a priority. You can get to the downloading task later and you won’t ever drop a call. Minimize Devices Connected - Try to minimize simultaneous wireless devices Internet connections. Multiple devices connected simultaneously to the Wi-Fi router will slow down Internet speeds for all devices. For example, if one device is streaming Netflix at the same time another device is downloading music files, the wireless Internet speeds for both devices will be slower. Get Radius Wi-Fi - To get the most out of your Wi-Fi speed, use Radius Wi-Fi to give you the extra boost you need. Radius Wi-Fi is a whole-home solution that keeps all of your devices connected. A technician will make an in home connectivity assessment and survey the residence for optimal wireless connectivity. In the event that boosters are needed, the technician will advise and install. 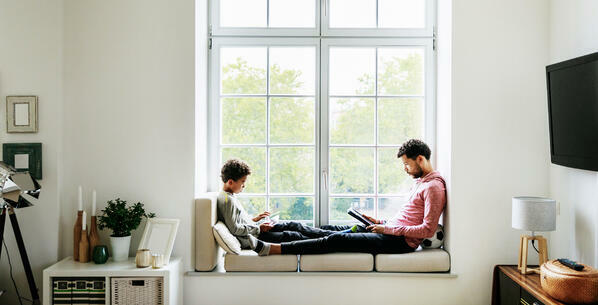 All of these tips are great ways to speed up your home wireless connection. If you follow these steps on how to speed up your home wireless network, your Wi-Fi will be up to your speed. To find out what Internet speed is best for your home, check out our blog, How Much Internet Speed Do You Need? If you found this to be helpful, make sure to subscribe to our blog for more content like this. Also, if you subscribe today you will be entered for a chance to win a Nest Thermostat!